Our awesome vacation in Yellowstone was really... uh... awesome! Granted it wasn't the quietest, most easy-going vacation as we had 4 children under the age of 5 along (and sometimes they weren't very happy about all of the car-rides), but it was still good nonetheless. 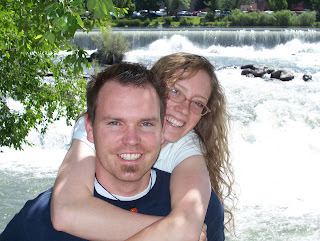 Here we are at Idaho Falls, a mandatory stop on the way up to the gorgeous national park. Here we saw some weird weasel-looking creature, a water rat thing that fought with the weasel and then made a leap at Michael's foot, and the beautiful falls with the temple in the background. 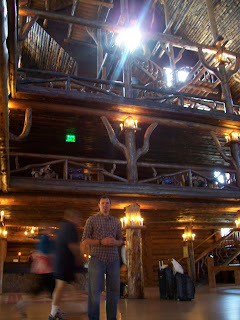 We spent two days or so at the Old Faithful Inn, a really awesome place. We met up here with Michael's uncle Mark and his family. 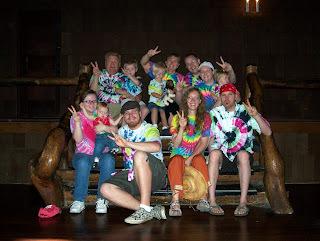 Mark really hates tie dye, so we just had to plan a tie dye day for our whole family just for him. We had lots of fun going on hikes around the Inn, cooking dinner in the picnic areas (that were full of mosquitoes! I got at least 20 bites, one of them between my eyes - every centimeter that wasn't covered in repellent was fair game), and just relaxing a bit in the beautiful Inn. After Old Faithful, we spent two nights in Roosevelt cabins, where it was much colder and there were less hot springs around, but there were a lot more animals and gorgeous, green scenery. This lake is on a hike about a mile behind the cabins, our last day there Michael dragged me out of bed before sunrise so that we could hike up and back before everyone was ready to leave. 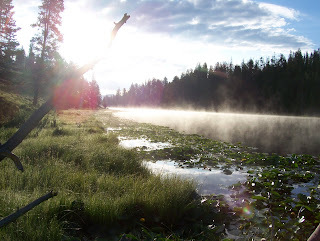 It was so beautiful; the mist was coming up off of the lake and the sunrise was just perfect. It was even too cold for the mosquitoes! Up in the Roosevelt area we saw a grizzly bear (from a long distance of course), a black bear, elk, lots of bison, and a family of coyotes with two pups. It was a really awesome part of the park that I'd never been to before. From Roosevelt we drove up to Mammoth and saw a lot more of the park I'd never seen before. 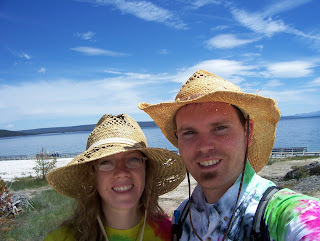 Here we are hiking around a geyser/hot spring walk around the lake. The next day I bought a new hat at the gift shop, so exciting! My old one had quite a few holes, but it was a good hat. Michael and I have decided that Yellowstone is definitely one of our favorite places on earth, and we just wish we could go back soon. We went on a lot of walks/hikes and drove around taking pictures so, since I have about 300 pictures, you'll have to go here to our online album to see them all. Here are a couple of short films we took with our camera - not too spectacular, but really fun anyway. 5 days sure were fun, we just can't wait to go back and spend more time in the beautiful park.